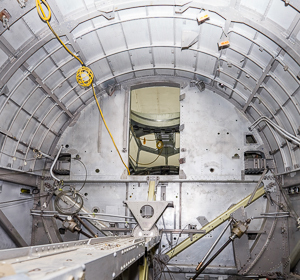 In July, 2015, I visited Wright-Patterson Air Force Base in Ohio for an update on the painstaking process of restoring the iconic World War II heavy bomber Memphis Belle to its appearance, almost three-quarters of a century ago, when it became the first American bomber to complete 25 missions over occupied Europe and return with its crew to the United States. As I explained in an earlier essay, I have a personal interest in this particular aircraft: my father, Eugene Kern (1914-2010), narrated a 1944 documentary about the airplane and its crew by the acclaimed Hollywood director William Wyler. The motion picture, titled The Memphis Belle: A Story of a Flying Fortress, is considered a classic of its genre. It was was shown in theaters throughout the United States, and provided an important boost to public morale at a time when the war wasn’t going well in either Europe or Asia for the United States and its allies. 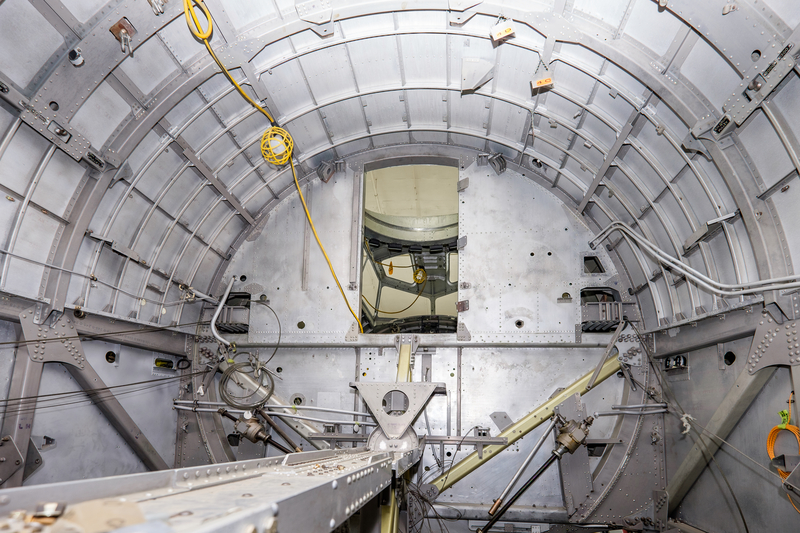 In the six years since my previous visit, the restoration staff of the National Museum of the U.S. Air Force completed most of the work on the airframe. The four massive radial engines have been overhauled and reinstalled on the wings, their propellers still unmounted but resting on platforms nearby, and the wings have been reattached to the fuselage. 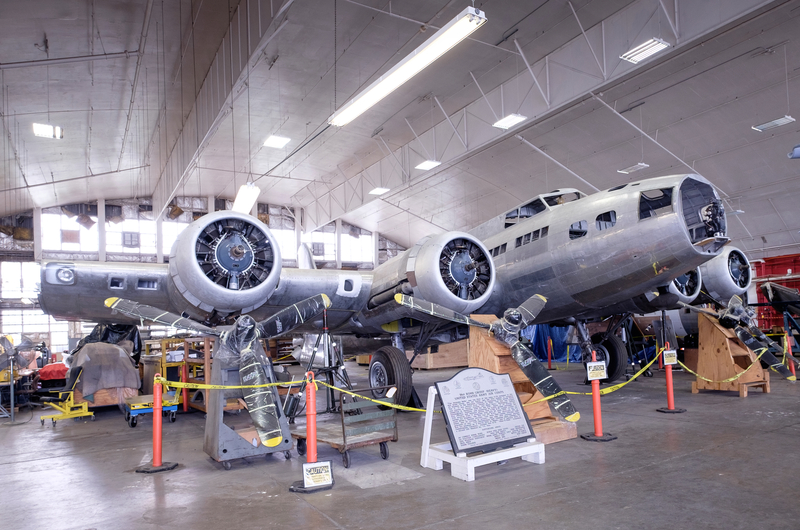 The airplane is now supported by its landing gear, and is positioned much as it would have been in 1943 when it was sitting on a hardstand at its wartime base in England. The B-17 was a ‟tail-dragger”—the main landing gear held up the wings and a small tail wheel kept the back of the airplane just barely off the ground, pitching the nose up at a rakish angle. The restorers still have considerable work to do on the interior. 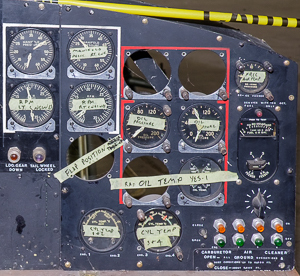 The airplane was stripped of many of its flight instruments and other removable parts by souvenir hunters and vandals in the years before the Air Force reacquired possession of it in 2005. Research is required to identify these missing components—a process complicated by the repeated modifications made to wartime bombers before, during and after their period of combat service—and contemporaneous substitutes need to be acquired or, when necessary, visually-identical facsimiles manufactured. Jeff Duford, the curator of the Air Force Museum, described to me the fastidious efforts by the museum’s research and restoration staffs to ensure the historical authenticity of the aircraft. The Belle’s wartime maintenance logs somehow survived, and have been closely scrutinized to identify every repair of combat damage and field modification made while it was flying missions over Europe. The museum staff also has reviewed the intelligence debriefings of the Belle’s aircrew that followed each mission, as well as other available contemporaneous records that might shed light on its precise configuration during the eight months it was based in England. Modifications made following its return to the United States are being identified and backed out. To the extent possible, the airplane that eventually is installed in one of the museum’s exhibition galleries will exactly match the airplane that returned from its 25th combat mission over Kiel, Germany, on May 19, 1943. (This attention to detail is not unique to the Memphis Belle; all the other artifacts on display at the museum that require restoration receive similar treatment). Robert Hanson, the radio operator of the Memphis Belle and the last survivor of the ten crewmen who returned to the United States in 1943 after completing 25 missions, died in October, 2005, the same month the Belle arrived at the Air Force museum to begin its restoration. But the restored airplane will serve as a durable reminder of the many young men—hardly adults, really—who risked and often lost their lives almost 75 years ago in the hostile skies over Europe. High-resolution originals of the photographs accompanying this essay are available by clicking on the inline images. These photographs may be downloaded or printed without express permission for personal, educational or noncommercial purposes only, provided that the copyright and other metadata accompanying the image are preserved intact.